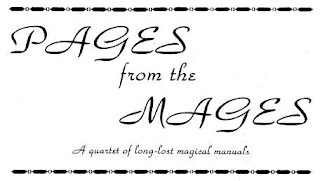 GROGNARDIA: The Articles of Dragon: "Pages from the Mages"
The Articles of Dragon: "Pages from the Mages"
Ed Greenwood catches a lot of grief among a certain segment of the old school community, usually for things for which he was not himself responsible. Perhaps these old schoolers associate his Forgotten Realms campaign setting with 2e and 2e with the regime that ousted Gygax or ... something. It's always been rather unclear to me what crimes against gaming Greenwood was supposed to have committed, especially when my earliest memories of his name are indelibly connected to articles like "Pages from the Mages," which appeared in issue #62 (June 1982). 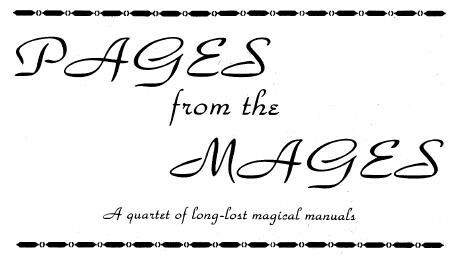 The article presents four "long-lost magical manuals" -- the tomes of powerful and famous magic-users, each of which is unique in some way. All four books are given a name, a description, and a history in addition to a list of their contents. Every one of these entries made these librams much more interesting than just a simple catalog of, say, the spells they contained or the magical effect they conferred upon their reader. Thus, we learn that the eponymous author of Mhzentul's Runes was slain at the Battle of the River Rising and that Nchaser's Eiyromancia contains not one but two heretofore unknown spells. Greenwood's articles always impressed me with their feigned depth. That is, they seemed to be part of a rich and complex setting, whose every little nook and cranny had been detailed beforehand so that he could just pluck them from his mind and present them whenever required to do so. As I learned later, this is a parlor trick, one that I learned to perform in time, too, but it doesn't make me any less fond of "Pages from the Mages" or its later sequels. In the span of comparatively little space, Greenwood provided readers with not only some new magical items to insert into their own games but models for how to make almost any magic item a locus of information about a campaign setting and, by extension, an inspiration for adventure. Love Ed's gaming material, despise his fiction. I never got the whole anti-Ed thing either. I think his gaming materials are pretty damn good. I associate his Forgotten Realms campaign setting with... his Forgotten Realms campaign setting. Honestly, I can't stand that world. Too many zillionth-level NPCs stomping around, making me wonder why my character is needed at all. That aside, I've liked some of his other stuff. Greenwood may not of written everything about the Forgotten Realms, but he certainly created its foundation, such as Skullport and Waterdeep, which are my two favorite post-Greyhawk modules and still play a big inspiration for designing my own cities. I was never overly fond of Forgotten Realms (particularly its later development), and Elminster struck me as a "Mary Sue" character on steroids, but I did like Ed's early articles for Dragon, and "Pages..." was something I regularly read. @ Revenant "Too many zillionth-level NPCs stomping around, making me wonder why my character is needed at all." This continued comment still baffles me to this day. I guess I never looked at certain adventures or never had a certain type of DM. I don't know if Ed was "the culprit" for it, but I certainly associate him with a certain baroque twist that TSR publications took at that time, with having taken a distance from the quasi-mediaeval European blueprint of the early D&D towards a faux 20th century fantasy world with "magic users' congresses" and stuff like that. "Greenwood's articles always impressed me with their feigned depth." I think that was the problem for a lot of people. I liked it, but not everyone does - to each their own poison. I liked his stuff a lot, enough to steal names and ideas from it for the AD&D game I ran in High School - just prior to the Forgotten Realms coming out. And it impressed me enough to buy and use the FR stuff. Elminster was a Mary Sue, though, and when I finally saw his stats I wondered why Shadowdale needed other adventurers to protect it. Oh well, easy enough to make him into a mere sage in my own games. And a lot of the FR stuff got annoying. Not only were there lots of very high level NPCs, but often they were explicitly off-limits for killing or effectively stymieing. Still I got a lot of good gaming out of his world, but mostly because I took it and ran somewhere else with it. Having just re-read Cugel's Saga I note that Vance was another master of this parlor trick - it's kinda perverse to try to reverse engineer such works into coherent worlds. And yet here we are. I note that Vance was another master of this parlor trick - it's kinda perverse to try to reverse engineer such works into coherent worlds. And yet here we are. I've found reading Vance is a very good way to prepare oneself for running an open-ended RPG campaign. I guess I never looked at certain adventures or never had a certain type of DM. I can't speak for the adventures (since I never played a FR module). I'm just talking about the campaign setting itself. The truth is that in AD&D high-level characters can mop the floor with an almost unlimited number of low-level threats. When there are 15th level characters within an afternoon's walk it is hard to believe that you're really, say, saving a village from a goblin incursion. What you're really doing is saving the 15th level character from having to skip his afternoon tea break, stroll over, and pimp-slap the entire goblin horde in 6 rounds. Look at a setting like the original Greyhawk -- the Slave Lords are mostly in the mid to high single digits. If you were a 10th level character, odds are the whole nation -- heck, a good part of the *world* -- knows your name. If you're a 10th level character in Forgotten Realms you're a lieutenant in the town guard. Crimes against gaming - I think Ed legitimised the style of play where GMPCs save the PCs from the consequences of their actions and maintain the stability of the GM's world, ensuring things don't get 'messed up'. The first goes against the Gamist approach many of us take to D&D. The second denies player agency. It's a far cry from Arneson's Blackmoor campaign, where the PCs *are* the movers and shakers of the world, as in a traditional wargame. It's also a far cry even from Gygax's Greyhawk, where high level NPCs are typically bad guys who need killin'. I think the things that Ed and his player group enjoyed in D&D - telling stories, interacting with the milieu/NPCs - were not what lots of other people were playing for. Greenwood D&D seems to me to not really be a 'game', and his setting wasn't designed for gamist play. I've also found Forgotten Realms strangely unsatisfactory to play (not to mention to DM!). As a player, there are *always* deus ex machinae at the disposal of the DM to railroad you. No matter what your character does, he never becomes a hero of great renown, because there's always Elminster! While, as a DM, I always found the whole huge mishmash annoying. A lot of basically parlor-trick generated setting to remember and stick to, which I always found more work and effort than just parlor-tricking on my own. Sorry for the necroposting, but I just came across the blog today. I enjoyed reading a lot of the 3rd edition FR stuff, was out of D&D playing other games in the 2nd edition era. But I never actually used it, in part for similar reasons. Maybe the answer to getting mileage out of Forgotten Realms is to shake it up hard. Open up with something mega having incapacitated or wiped out all the really big characters, Elminster included. This sets everything in ferment, and your lowbie but growing PCs really can have a big influence on the outcome. It could also give PCs a reason to be nervous if the culling isn't just all at once and some of their rivals start getting offed by the mysterious force as they rise. Maybe a part of the core quest is to make the world safe for their increasingly high level selves. Just don't allow "bringing the big guys back for stability" to be an option. Would need to come with a convincing plague upon the powerful to make it work. Open Friday: What Does It Mean? Open Friday: When Did You Enter the Hobby? The Articles of Dragon: "Without any weapons ..."
The Articles of Dragon: "The Jester"
The Articles of Dragon: "Modern Monsters"
The Articles of Dragon: "Singing a New Tune"